This map shows the land that will change hands as part of a Norwegian aquaculture firm's push to build a $150 million land-based salmon farm in Belfast. 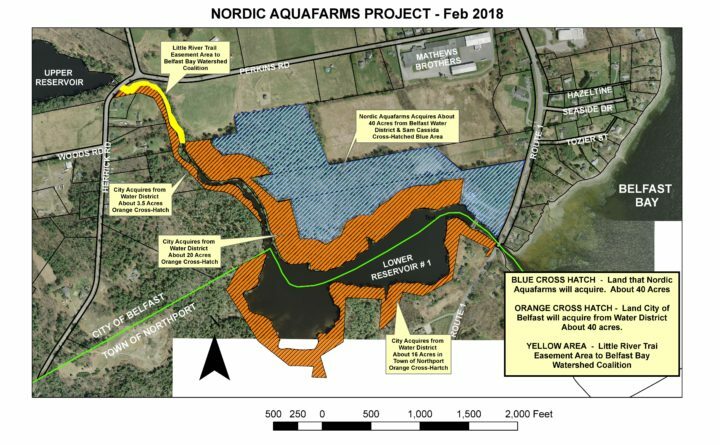 The blue area depicts 40 acres Nordic Aquafarms will purchase from the Belfast Water District and another local landowner. The orange area depicts another 40 acres the city will acquire from the water district. BELFAST, Maine — A Norwegian company planning one of the world’s largest indoor fish farms in Belfast faces its first significant hurdle on Tuesday, as city councilors decide whether to change the zoning at its proposed site. That hurdle must be cleared before the company, Nordic Aquafarms, can start lining up required permits and approvals from federal and state agencies. Nordic, which operates two indoor farms in Denmark and has a third under construction in Norway, plans to produce 33,000 tons of Atlantic salmon per year at the Belfast farm. Its initial investment of $150 million could grow to $500 million in later phases of the project. Nordic expects to hire about 60 people to operate the facility. The company plans to purchase 40 acres off Route 1 near the Northport border for the development, but it needs to be rezoned before the process can move any further. The water district owns most of that land and will sell its share to Nordic for $1,059,000. Nordic also will purchase a 12-acre strip from a private owner for an undisclosed amount of cash. Nordic has been digging test wells to find out what kind of water resources lie underneath the property. Eric Heim, the company’s CEO, said the site sits at the end of a large, “promising” watershed that drains into Penobscot Bay. Under its water supply agreement, the city’s water district has promised to sell a minimum of 100 million gallons to Nordic each year for six years. The city will cover about half the cost of filtering that water annually — up to $120,000 — for the first six years of the farm’s operation. Most of the water used in the facility will be salt water drawn from the bay. Heim said Nordic can’t yet provide precise answers to questions about water usage or tank number and size because much depends upon where structures are placed and how they’re laid out. For the past two months, the company has been mapping the site, testing soil and digging test wells to determine the best placement. He hinted that work should be concluded in May, and the company should be able to reveal its first designs of the project. Then it will be able to come up with clearer estimates of energy use, tank capacity and water use before moving on to environmental and building approvals. Once zoning is completed, Nordic will spend the next year having its plans vetted by federal and state agencies. Shovels won’t hit the ground until 2019. Still, that seems too quick for some in town. As Nordic irons out its plans, a small opposition group is trying to build support and convince city councilors to slow things down. The group, calling itself Local Citizens for Smart Growth, is made up primarily of Belfast residents who fought a runway expansion at the city’s airport several years ago. The group reassembled during the push for the aquaculture site, according to Ellie Daniels, a member and downtown business owner. About 35 people attended its most recent meeting. “It’s too much, too fast, and we want them to slow down,” Daniels said. The group has sent out emails and posted fliers asking residents to share their concerns and questions with the city planner. They cite a list of concerns ranging from water and electricity use to fish welfare and traffic levels during construction. One claim, based on a 2016 International Salmon Farmers Association report, is that an indoor farm of this size would require 60 billion gallons of water annually to operate. Heim said that estimate is vastly overblown. The ISFA estimate assumes a farm would use depuration — a process in which a tank is repeatedly emptied and refilled to clean the fish before they’re harvested. Heim said that won’t be necessary because the water will be constantly cycled and filtered, keeping the tanks clean and free of contamination. Tanks will need to be emptied entirely and refilled only on rare occasions for cleaning and repairs. Also, most of the water in the tanks will be salt water drawn from the bay, not fresh water from the aquifer. Heim argued it wouldn’t make sense for his company to pump hundreds of millions of dollars into a facility without knowing that it had access to enough water to sustain its operations long term. Another concern is the amount of nitrogen the farm would discharge into the bay. Heim said the exact numbers aren’t yet available, but that the amount of nitrogen released by the farm would be less than what is released by the city’s wastewater treatment plant. The farm’s discharge pipe will extend about a mile into the bay, rather than right offshore. The density of the fish in the tanks has been another point of interest. Crowding too many fish into a tank can affect their growth and health. Heim said that research at existing farms in Europe puts the optimal density range at around 150-175 pounds of fish per cubic meter, though some do operate at higher densities. Tinkering with salinity levels, water temperatures, feeding and light levels can affect the growth rates and taste of the salmon. “Our primary goal is to produce a high-quality fish, not to get it out the door as quickly as possible,” Heim said. Samantha Paradis, Belfast’s mayor, said city officials have been listening carefully to people’s questions and concerns, and that they would be carefully considered to ensure any negative impacts of the farm are kept to a minimum.